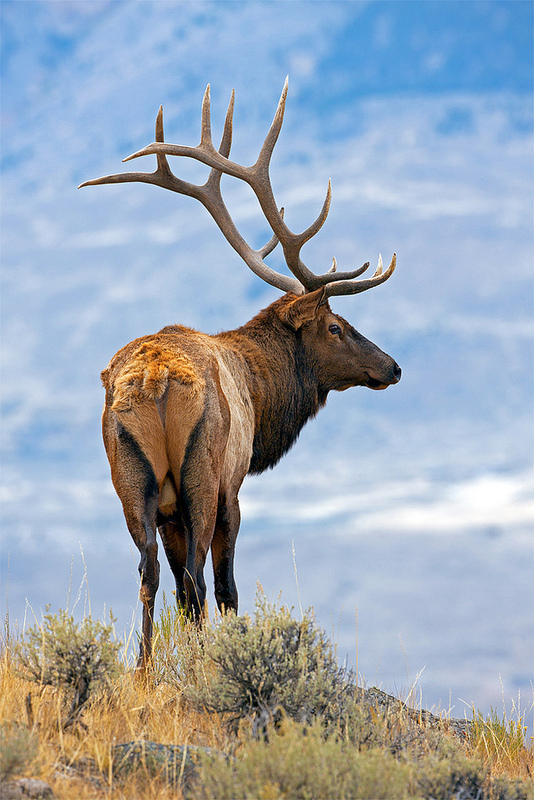 The magnificent Wapiti (Cervus canadensis), also known as the North American Elk, is the second largest member of the deer (Cervidae) family. To keep these 700 pound mammals nourished, they eat about 20 lbs. of food each day, consisting mostly of grasses, bark and their favorite munchable, aspen shoots. This impressive bull was roaming Yellowstone National Park with his harem of about 25 cows. The herd was grazing and foraging its way toward the top of a ridge, and this large male crested the top just as the setting sun became magical, setting him aglow while elegantly highlighting his power and beauty.